Ever have one of those weeks where you need a big plate of brownies? 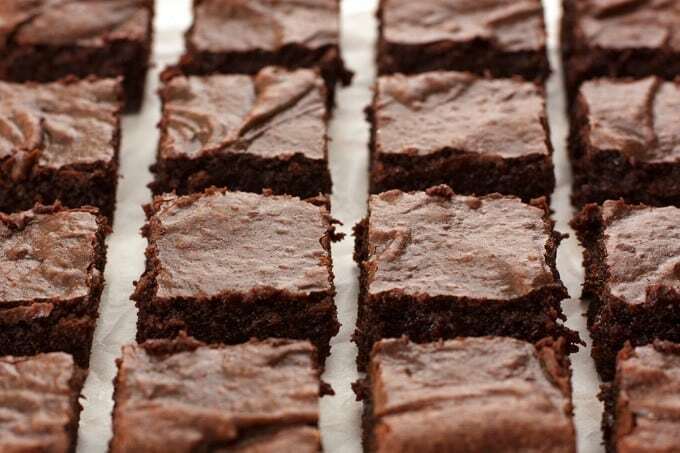 Brownies are one of my “everything is okay no matter what” foods. This week, “no matter what” took the form of “I’m crazy busy!” But when I looked in my pantry disaster, — no semisweet chocolate! I carefully looked under every peppercorn and stray cilantro leaf in the cupboard, but I found no semisweet chocolate. I typed the sad keywords in my search engine. “how to make brownies without chocolate”. I spent several long minutes sifting through the results, mostly just wishing I had semisweet chocolate. It may have been faster to just go out and buy some chocolate. Or brownies. But if I had any time to run out to the store, I probably wouldn’t want brownies anyway. Sad and dejected I headed back to my kitchen. As if there could be a plan b for brownies. Out of the corner of my eye, hiding out of the way in the spice bin, I spotted something chocolate colored, yet powdery. Cocoa powder! After what must have been the most agonizing 0.42 seconds ever, google returned my search results and cocoa brownies were found! 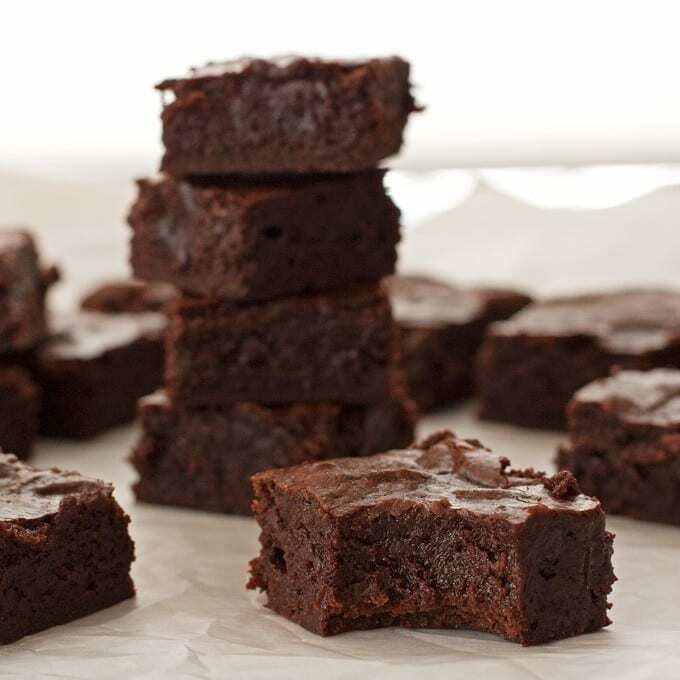 These brownies are super rich and fudgy. 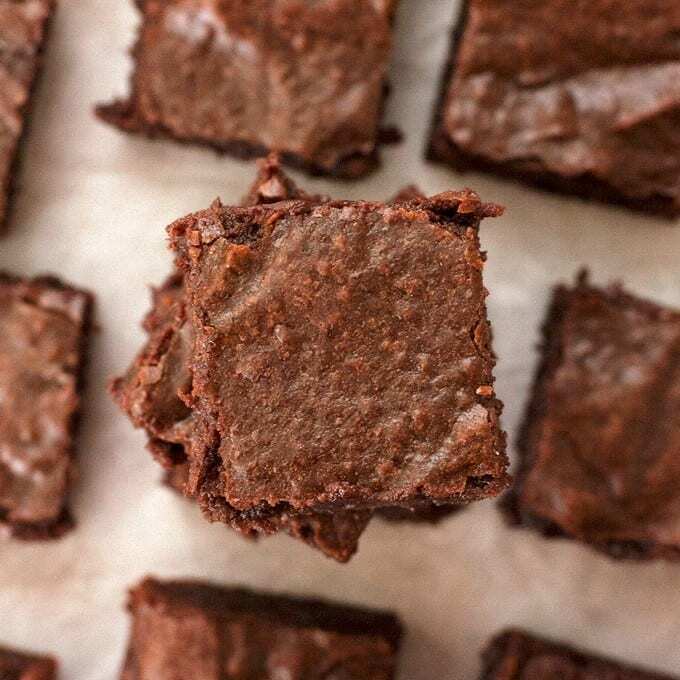 I made some modifications to get that irresistible chewy brownie texture. Rich, chewy, decadent fudge brownies made with cocoa powder! Preheat oven to 350 degrees. Line an 8x8 baking sheet with parchment paper. Combine butter, sugar, and cocoa powder in a large microwave safe bowl. Melt in microwave on 50% power for about 3 minutes, stirring every 60 seconds. Mixture should be hot to touch, but not scorching. Let cool slightly until warm, about 2 minutes. Stir in vanilla then stir in 1 egg at a time until completely incorporated. Add flour and salt, and stir until you can’t see any flour. Stir vigorously for 1 additional minute. Spread evenly in parchment paper lined 8x8 baking pan. Bake until a toothpick comes out almost clean, about 25-30 minutes. Let cool completely on a wire rack. 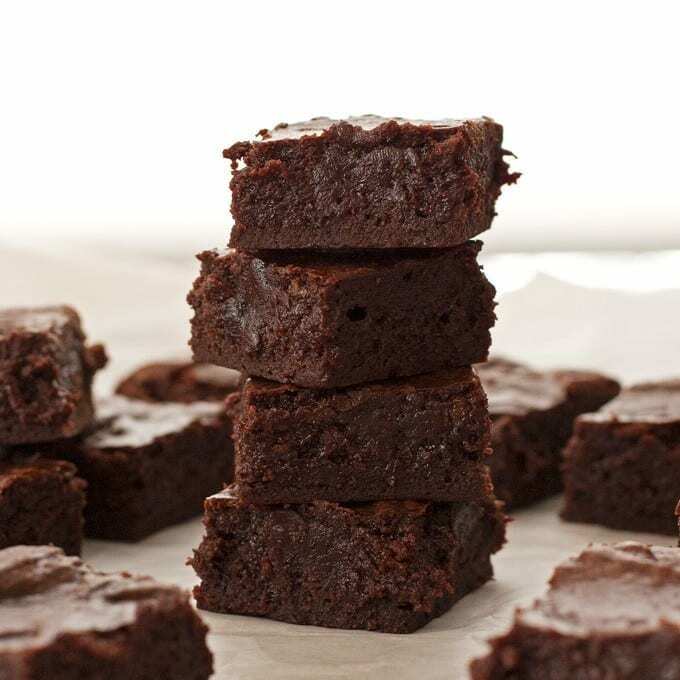 Lift up parchment paper and cut into delicious brownie pieces. Enjoy! Thanks Michelle! These brownies really came out rich, dark and delicious 🙂 I’d love to hear what you think of them if you give the recipe a try! ‘I typed the sad keywords in my search engine. “how to make brownies without chocolate”.’ This cracked me up! It wouldn’t be brownies without chocolate…although I think there’s blonde brownies, wonder what’s in them??? 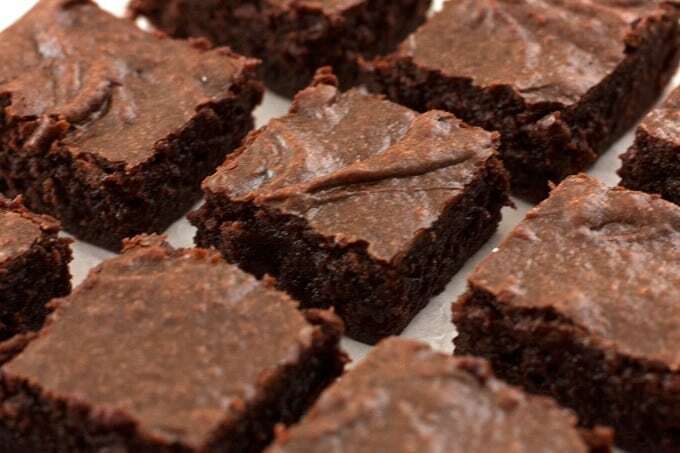 I always make the boxed brownies but this sounds easy and I do have cocoa powder! That’s funny…I’ve never made brownies with chocolate before, only cocoa powder! These look delicious! Brownies certainly do make everything better! Thanks for catching that Tay! I’ve updated the recipe — the salt gets added with the flour.